Everything is now packed and ready for the drive to Heathrow at 4.00am tomorrow. The start of this year's trip follows the same pattern as before: fly to Oslo, pick up the hire car, drive to Arvika, camp overnight, spend the first day buying 2 week's worth of food and supplies. Another overnight camp and then to the outfitter to collect the tent, canoe, paddles, portage trolley, etc and finally the landrover trek to the get-in, this time somewhere north of Algsjon. Assorted Ortleib and Exped drybags for double bagging essentials such as sleeping bag, mat, cameras and clothing. Everything is then packed into a Nookie 100ltr drybag which is securely tied down in the canoe. The only untested kit I am taking are the Five.Ten Canyoneer 2 boots which I bought at Paddlefest in April and the Reed Aquatherm socks. I know Reed Chillcheater very well, I've used their gear for years and have no concerns about the quality or the capabilities of their products, it's top quality throughout. The Canyoneer 2's are a bit of a shot in the dark, but they are well made with good attention to detail. 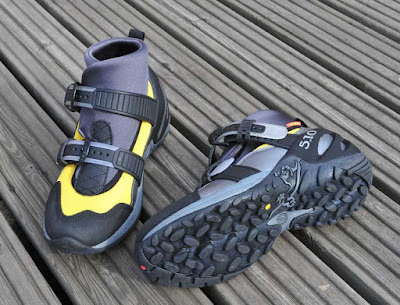 The materials certainly seem to be up to the job, they are designed for canyoneering but more importantly they are comfortable. A strap and buckle closure would seem to be a weak point in any design, but these are very robust. The boots are reasonably stiff and the soles are made of a sticky rubber compound, which will be useful on the portages. 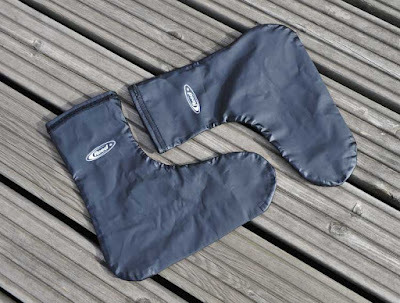 The fold-over cuff is neoprene covered in lycra and is comfortable and supportive. The upper is mainly mesh with a side drain-hole. I know I'm pinning a lot of faith on these boots, but given the high quality of materials and workmanship, I'm confident that they will be up to the job.